HostGator has been around for ages and still a very respected web hosting company. They currently offer 5 VPS hosting plans to choose from ranging in price from $19.95 to $159.95 with their most popular plan being the Snappy 1,000 plan because it offers the cPanel control panel for easy VPS management. In this review, we will take a look at HostGator’s VPS plans, plan features, pricing, their customer service and much more to help you decide if this VPS hosting company is the right choice for you. Save 25% off your HostGator VPS hosting package. Click here to go to our HostGator coupon page or use coupon code t5ahgoffer. No long-term commitments required. Offers one of the biggers self-help sections we’ve seen. Pricing includes cPanel control panel with exception to SNAPPY 500 which doesn’t offer a CP option. 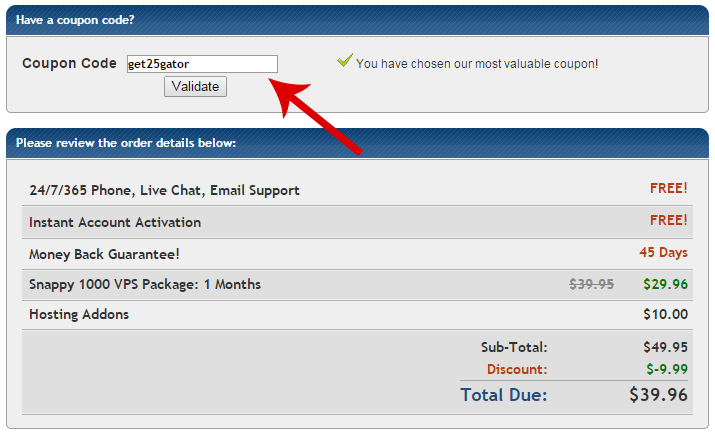 HostGator charges $2 for every additional dedicated IP address you need. HostGator leases their servers and only has one data center to choose from. SNAPPY 500 – You’ll share half a CPU core. The plan includes 512MB RAM, 25GB disk space and 500GB bandwidth for $19.95/month. This plan is not recommended because it only includes the Virtuozzo control panel which is a headache to manage. SNAPPY 1000 – Their most popular VPS plan. Includes 1 CPU core, 1GB RAM, 60GB space and 1TB bandwidth for $49.95/month. If you choose HostGator, this is the plan we recommend. 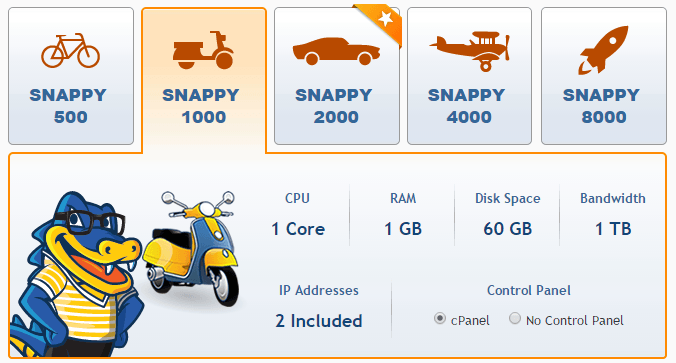 SNAPPY 2000 – Includes 2 CPU cores, 2GB RAM, 120GB space and 1.5TB bandwidth for $89.95/month. SNAPPY 4000 – Includes 2 CPU cores, 4GB RAM, 165GB space and 2TB bandwidth for $129.95/month. SNAPPY 8000 – Includes 4 CPU cores, 8GB RAM, 240GB space and 3TB bandwidth for $159.95/month. As mentioned, for most, the SNAPPY 1000 plan will be the best and cheapest plan to choose because it will offer all the space that most will need while also including the cPanel control panel. With each plan, you’ll be able top host unlimited domains, subdomains, email accounts, MySQL databases and FTP accounts. You’ll also have weekly off-site backups, a free sitebuilder software, private nameservers and full root access. HostGator offers a Support Portal that is seemingly geared towards their shared hosting clientele. We were able to find an entire WebHost Manager (WHM) section for those that choose cPanel/WHM on their VPS (most should). This section includes over 60 topics that will help you navigate your way through your VPS server. Additional smaller subcategories will help you with root access problems, WHMCS (a customer management portal for resellers) and WHM Autopilot which is a system similar to WHMCS. Video Tutorials – They offer a comprehensive video tutorial section for WHM users called “WHM Dedicated” which applies to VPS users as well as dedicated server users. There are tens upon tens of videos there that will walk you through creating cPanel accounts, managing quotas, DNS, navigation, upgrading the system software and much more. This section will be extremely useful for those new to VPS plans. Forums – They offer a section to VPS users called “Linux VPS Support” that currently has over 500 topics and 2,650+ responses which we consider quite small. However, the many of the latest posts we’ve seen on their forum include a lot of complaints about their customer support, VPS outages and more. We didn’t like to see these posts ignored for almost a month with no official response from their support staff. Keep this in mind and be sure to check their forums for up-to-date information before ordering. Company Blog – We were unable to find any blog topics related specifically to VPS users. There’s a “web hosting news” section but it mostly talks about vulnerabilities and web hosting topics. We wouldn’t recommend this section of their site to learn about your VPS. HostGator uses Supermicro servers with AMD Opteron 6,000 series CPUs along with a RAID disk array. They currently use 2 datacenters, one in Houston Texas (CyrusOne Houston facility) and one in Provo Utah (Ace Data Centers Facility). HostGator appears to have fallen a bit in quality and reputation since our last review in 2012. The brand is now owned by Endurance International which may have some to do with problems we’ve seen reported. We’ve paid attention to what the hosting community has said about the company and while most have remained loyal customers, many have decided to switch to other providers with reasons ranging from increased outages, support problems and more. From our analysis, we’ve determined that the popularity of HostGator for VPS plans has deteriorated. There’s just not as much “buzz” around this host as they used to have on popular web hosting discussion forums. The topics we did find suggested that people were leaving this company for KnownHost which is a brand built on a solid reputation. 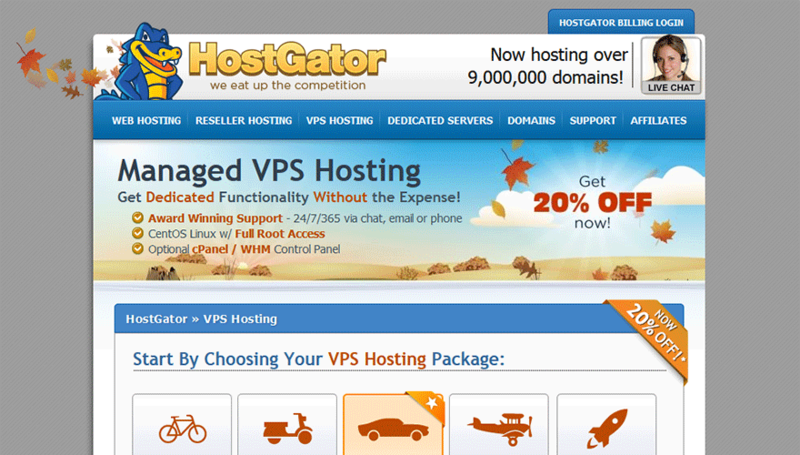 How has your experience been with HostGator’s VPS service? Leave your review below and let the world know.